We’re very excited to have access to a fire pit and the ability to use it! Weretoad was thrilled to be the fire keeper and took this wonderful photo. 2012. 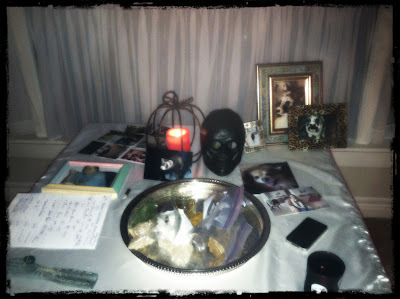 Last night, the North Country Druidic Study Group gathered for its second ever ritual – Samhain! Although a few days after the calendrical holiday, my Druidic tradition believes that the veil remains thin for some time. Personally, I view it like the lunar phases. Samhain is when it is at its peak, while the days before and after are waxing or waning towards that point. With that in mind, we gathered at the Kripalu Yoga Center in Adams, NY. As I discussed before, it’s absolutely perfect for our group. 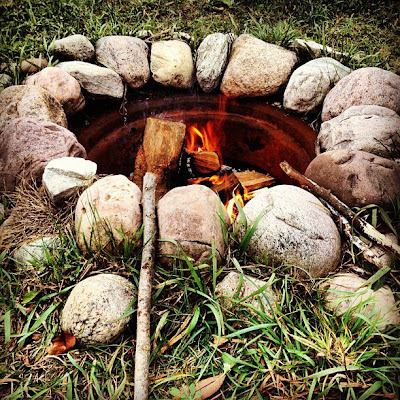 We have access to a stone circle with a fire pit that we can use! In addition, we can use their indoor facilities for our potluck. Their hospitality has been such a gift and I pray we made a good impression. We’ve already been welcomed back for future gatherings so I have a good feeling that this is the start of a good relationship! As you can see, the stone circle is beautiful! Photo by Weretoad, 2012. The ritual went well and everyone seemed to enjoy it. I grow in confidence each time I lead one. The omens I drew, which, like Muin Mound, I interpret as the lessons and blessings we will receive from the Kindreds this quarter, were very positive and spoke of staying strong and connected to ourselves, our families, and the Kindreds over the harsh winter. The chanting remains a challenge. I’m keeping things simple and introducing a chant at a time. I goofed on the closing chant, but live and learn, right? Winter was definitely in the air, emphasizing this time as the beginning of the dark half of the year. We actually saw snow on our way to the ritual! The trees, compared to the shot of the stone circle above (which was taken in October) are now bare and skeletal. For at least one member, the mysteries of death suddenly made sense based on Nature’s lessons. Our ancestral altar complete with mementos and offerings. Photo by Grey Catsidhe, 2012. After the rite, we made our way into the warmth of the Yoga Center for our feast. We had quite a spread and welcomed our Ancestors to our revels! The group is growing closer and bonding over our interests, our love of nature, and our call to Druidism. We chatted with folks from the Yoga Center about meditation, energy work, intuition, and daily devotionals. It was a wonderful evening and I know everyone is excitedly looking forward to the Winter Solstice! The wheel turns and we move and grow with it. Hi Grey! I am glad your ritual went well! Many Samhain blessings to you. Amazing; so fascinating and it’s very cool to have such a hands-on experience.